Q - If we are in the need of medical assistance or attention, where can we go and who can we see? There is also state hospital on the road towards of Kas which is 15 minutes drive from Kalkan. If you require dental treatment, Cenk Sahin has a dental practise along the Kalamar Road. You can reach him from +90 242 844 3696. The local chemists (Eczane) can provide advice / remedies for minor ailments. Operation hours are generally 9am-8pm. Q - In the event of an emergancy, what is the number to call? A - The only emergency number you need in Kalkan is 112. Calling this number will enable you to make contact with the police, Jandarma, fire brigade, ambulance or coast guard. This number covers the whole of the Antalya region of Turkey. Q - Is there anything we should be generally aware of with regards to the property we rent? 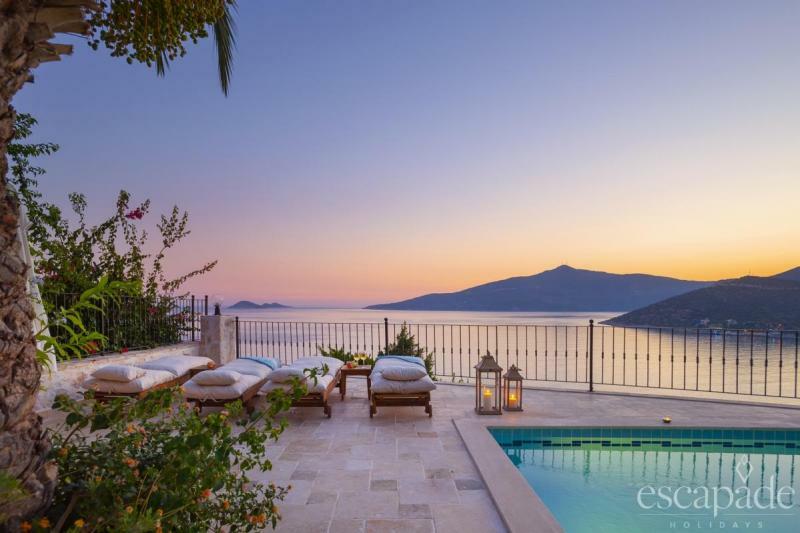 Electricity Supply: Kalkan has frequent power cuts however these are usually very short. If candles/tea lights are supplied at your accommodation, please take care not to leave burning candles unattended and please do not place them near curtains or other flammable materials. Water Supply: We kindly recommend that you don’t drink the tap water in Turkey as its high mineral content may cause stomach upsets. Large containers of drinking water are available at plenty of outlets in the village. Checking In & Out Times: Check in time is usually 3pm and check out time is 11am. If you require a later check out time, this may be possible but it will be at the discretion of the management agents and is subject to availability. We do provide a luggage hold service and keep your luggage in a safe place until you need to depart for your journey to the airport. As you leave the property and if one is provided, please leave the villa keys in the Key Safe by the front door on your day of departure and ensure that both the Key Safe and villa are locked securely before your departure. If a Key Safe is not provided, please leave the keys on the in-door dining table and ensure that all doors and windows are firmly shut before you leave. Security: Most of our properties have a safe fitted. Please ensure that you use it for small amounts of cash and small valuables. We do not recommend that you use it to store large amounts of cash. Your Valuables: Please take care not to leave your cash and valuables; i.e. jewellery, mobile devices, tablets, camera equipment on display. We would ask you to please common sense as you would at any other tourist destination. Safety: Safety Guidelines and Regulations in Turkey are not same as those applicable in the UK and our properties are not necessarily ‘child-proof’. It goes without saying that children need to be supervised, particularly around the pool area, at all times. The ground surface and staircases, may become extremely slippery when wet, therefore, caution is required at all times. Do NOT go out of your depth and know your own limits (Usually all efforts are made to indicate the depth of the swimming pool facilities at both ends). Do NOT swim if you cannot see the bottom of the pool. (Inform our supervisors as soon as possible). Avoid swimming if you have been drinking alcohol, especially late at night. Be aware of dangerous surfaces, drainage channels, slippery tiles or raised edges. Always supervise children and non-swimmers in and around the pool area. Cleaning & Linen Changes: During the cleaning operation, bins are emptied and rubbish is removed. We request that you don’t use the towels that are provided in the bath/shower rooms around the pool or at the beach. We would also ask that you are careful when using self tanning products and sun-tan lotion as these products can permanently stain bed linen, towels and upholstery. Please inform our field supervisors to take the necessary action accordingly if such stains occur. Please note charges may apply if sheets and towels need to be replaced as a result of such staining or upholstery requires specialist cleaning or replacement. WC: Please use the bins provided to dispose of paper/sanitary products. Small bore pipes are used and paper will block the drains.! Small bore pipes are used and paper will block the drains. Turkish WC has a tap that enables it to be used as a bidet, toilet paper is just used for drying purposes. Smoking: Out of courtesy for our non-smoking guests and in the interests of fire safety, we would ask you not to smoke anywhere within the property. Air-Conditioning: All of our properties are fully air conditioned. In order to work effectively we suggest you to close all the doors & windows. Wi-Fi: Most of our properties have a wi-fi connection. There are also numerous Wi-Fi hotspots around the village and in most cafes and restaurants, the owners who have Wi-Fi will be happy to let you use their connection for free. Please make sure that your mobile phone’s data roaming facility is switched off to avoid a shock with your next phone bill. Breakages & Faulty Appliances: If any item is accidentally broken during your stay or if an appliance is not working properly, please let our supervisors know about it so that it can be replaced/repaired. Please Note that some breakages may be charged for.